The Library provides Internet access free of charge to all patrons. There are twelve Internet stations for use by the public. Each is equipped with word processing capability. Software is installed on each station limiting the amount of time spent on library computers to one hour per day. This is to assure that all patrons have equal access to the computers. The Library also has Wireless Internet access. This allows patrons to bring in their laptop computers and access the Internet. No waiting for a computer, sit anywhere, no time limits! Click here for connection information. The Library also can offer two laptop computers that can be “checked out” to patrons to use while they are in the library wherever they would like to sit. 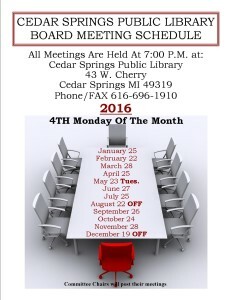 The Cedar Springs Public Library circulates a wide variety of materials including books, audiobooks, and DVDs! Read below for additional information regarding our circulation policies. Most items can be renewed once if no one else is waiting for them. Renew in person at the library. Renew by phone at (616) 696-1910. Fines for motion pictures DVD are $1.00 per day up to a maximum of $10.00. View your patron record to check for overdue fines. Holds may be placed on most library materials through the online catalog. If the item you want is not available at a Lakeland Library Cooperative library, Cedar Springs Public Library cardholders can request that staff search further for it. loan. Let us contact you by E-Mail Notification when your holds are ready or you have an overdue item. Library materials must be returned to the library that they were checked out from. Therefore items checked out at the Cedar Springs Library must be returned to the Cedar Springs Library.